Donuts On A Stick was not the first donut place on the Outer Banks; the most well-known would be Duck Donuts, with several locations of their made-on-the-spot donuts and coffee. But being gluten-free, I got very excited when I read an ad for Donuts on a Stick and it mentioned gluten-free donuts. So we had to make a trip. When we arrived, we learned that we would have been better off calling in our order a day prior, to request a gluten-free donut. Lucky for me, they had one left. They also make homemade chocolate chip and french vanilla ice cream (plus soft serve), and they carry some standard premium flavors that they don’t make themselves. Of course, we wouldn’t want to visit without a donut! I got a gluten-free donut with fudge and bacon for toppings. The gluten-free donuts are made daily. It was an excellent cinnamon-y, cakey donut with delicious fudge and warmed up, super tasty, if average quality, bacon. They add the toppings of your choice on the spot and it was so delicious. Ross went with two (they’re smaller) chocolate peanut butter donuts, and he found the base, which is made on the spot when you order, similarly cakey and excellent. Ross’ donut was the donut to beat, according to him. It came right out of the fryer. The outside got crispy when it was fried. Just awesome. He found the peanut butter excellent, although the chocolate was “fine”. He thought two donuts was the perfect size. It’s easy to eat these with the provided fork, but they’re too messy to eat on a stick. We love the homemade ice cream option here, and the donuts are out of this world. It’s an affordable treat, with $12.60 total for two ice cream and two don’t orders. The donuts are very filling, and the warm toppings are delicious. If you were wondering, the next time we returned here, I got a donut sundae and Ross got a donut ice cream sandwich. I went with a Cinnamon Roll donut, with vanilla glaze, cinnamon and sugar as part of my sundae. Ross went for a Pancake donut, with syrup, butter and light powdered sugar. Donuts on a Stick is probably our absolute favorite place to eat on the Outer Banks. It is highly recommended as a stop during your vacation. Enjoy, and call ahead if you’re gluten-free or vegan! Head here to learn more about our favorite spot on the Outer Banks for soft serve (it’s custard and it’s amazing). 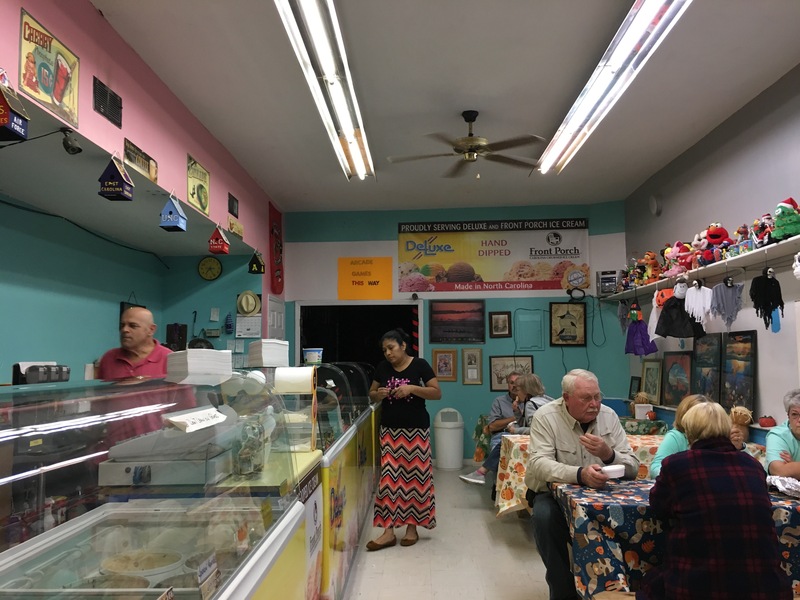 And to read about our favorite place for hard ice cream and ice cream cakes on the Outer Banks, head here. The Worst Ice Cream in North Carolina? I try not to be a negative Nellie on this blog. I love ice cream and I appreciate how relatively easy it is to come by, even homemade, in most places, and I don’t want to dissuade those who make it or sell it with negative reviews. That being said, ice cream isn’t always good. Sometimes, it’s awful. And I wouldn’t be doing my job if I didn’t report it to you. 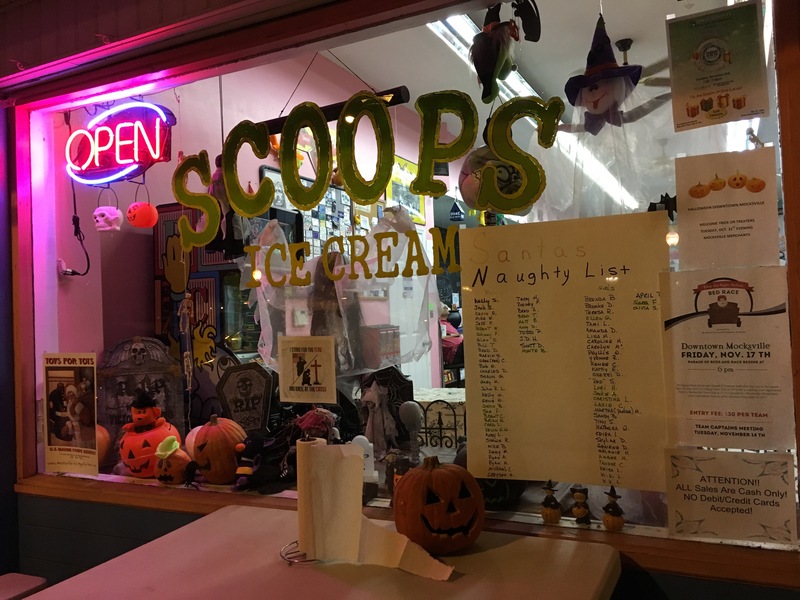 After visiting two delightful ice cream locations on the Outer Banks named Scoops this summer, I was hoping Mocksville, NC, which proved to have a cute little downtown, would also hold a delicious ice cream option with the name Scoops. 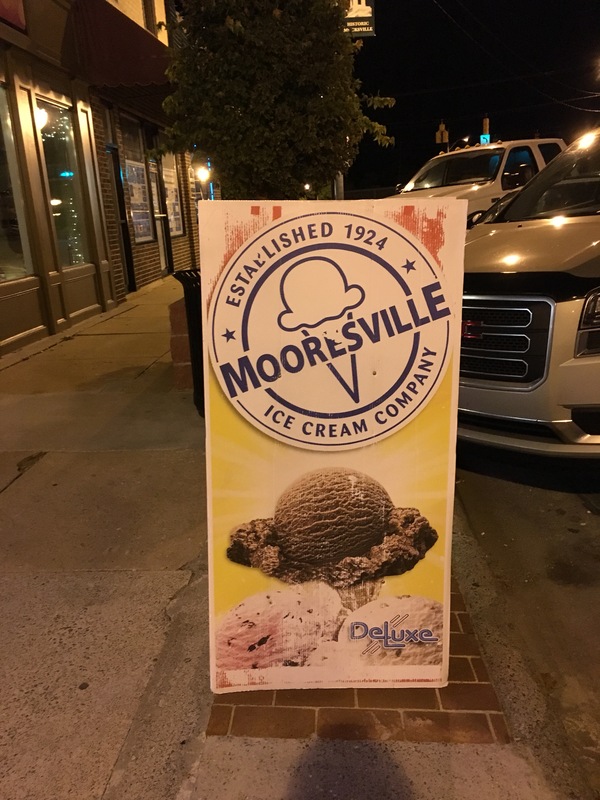 They carry Mooresville premium ice cream, according to the signage, which was labeled as either “Deluxe” or “Front Porch” depending on the flavor. Even though they don’t make the ice cream in house, I was happy to review a North Carolina-made ice cream. The signs didn’t bode well for this place. They had some signage that I found offensive, and they didn’t have a list of flavors anywhere – you had to walk the gigantic counter the length of the long store to see all of the offerings. That meant walking within a few feet of each table, where I felt people staring us down as I tried to make my decision. The prices are really cheap. Crazily so. I paid $3 with tax for one scoop, which would have easily been two anywhere else. They didn’t offer any samples, although I didn’t ask, so I settled on Peppermint Moose Tracks, which sounded like the perfect “me” flavor. Peppermint ice cream with white chocolate chunks and that amazing fudge swirl you find in moose tracks. I wish I’d tried other flavors so I would know if they all tasted like this one. I’m sorry for that. And if it turns out Mooresville is usually really good, let me know and I will try it again somewhere else! Ross, my husband, said this wasn’t very good. It was like ice cream that had sat open in a freezer for a year and then was put in the counter for forty five minutes before serving. He did like the white chocolate chunks though, for texture. He called this the flat soda of peppermint ice cream. Despite how gross it was, Ross was happy to finish eating it. I, on the other hand, visited the closest gas station for Breyer’s vanilla, which I topped with chocolate chips. Anything to wash the weird taste and disappointment out of my mouth. Don’t ever go to Scoops in Mocksville. It was wrong on so many levels. But if you’ve had Mooresville ice cream, did you like it? Did we just get last year’s batch or something? The flavor isn’t even on their website. Thanks for reading, and I hope you find something delicious today!